This week’s edge includes: Beacon Hill Area Neighborhood Association and a heavy-handed developer, Esperanza Peace and Justice Center's "Take Back Our City,” video from conversations across San Antonio about racism, a critical look at the Alazán Creek trail project and an extraordinary portrait of the city’s visual artists. When the Beacon Hill Area Neighborhood Association exercised its right to appeal to the San Antonio Board of Adjustment over part of a plan for a convenience store at Fredericksburg Road, the response shocked them: The local development group, GFR Development Services, threatened them with litigation. Courts have a name for such frivolous and illegal lawsuits: Strategic Lawsuit Against Public Participation, or SLAPP suits. Find out how two lawmakers are using the Texas Citizens Participation Act to help neighborhood associations and other community organizations get SLAPP suits dismissed easier and faster. 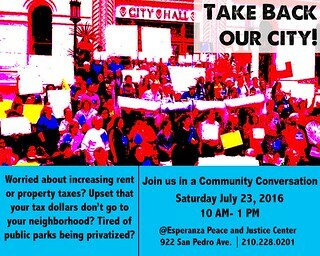 For more about neighborhood concerns, tune in on Saturday, July 23, when Esperanza Peace and Justice Center hosts a community discussion called "Take Back Our City." 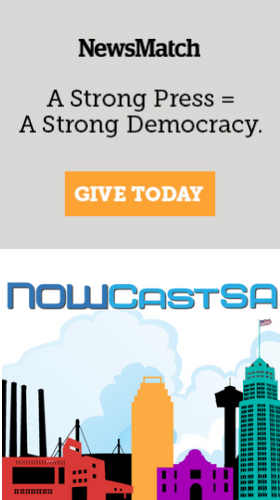 People are coming together all over San Antonio for some meaningful conversations about racism, equity and justice and we’ve got our cameras on it so you can be there, live or later. On July 12, 100 people gathered at the Muslim Children Education and Civic Center for a town hall discussion with religious leader Shaykh Omar Husain. Our video highlights discussions on police brutality, racism and ideas for working towards change. What happened with the recently opened first half-mile reach of Alazán Creek trail? Commentator Mark Tirpak takes a look and says it came up lacking and shows disregard for the Westside Creek Restoration Project Conceptual Plan. You have until September 16 to visit the Culture Commons near City Hall to see an extraordinary exhibit.